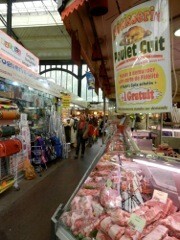 I recently had a chance to revisit the Saint-Quentin covered market in Paris. I was delighted to see how refreshed and reinvigorated it feels since some renovations and changes. 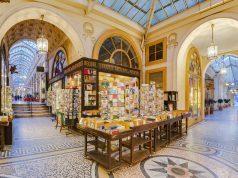 Located in the 10th arrondissement, not far from the train stations Gare de l’Est and Gare du Nord, this market attracts neighborhood residents as well as commuters who pop in for a few provisions before heading home. Le Marché Couvert Saint-Quentin is one of the city’s oldest and most striking market buildings. Designed by Rabourdin, this covered market showcases the Baltard style of architecture and is one of the few remaining buildings of its kind. The 19th-century building stands apart from its neighbors in its combination of materials (brick, wood, glass, cast-iron) and its graceful steel arches. But walk inside for the full impact. Natural light streams in through an expanse of glass windows. You might gasp, as I did, at the soaring ceiling. It doesn’t have to be a sun-drenched day for light to infiltrate and fill the large public space. One of the reasons I adore covered markets in Paris is the chance to step away from a pulsating urban neighborhood and enter into a very different but fascinating self-contained world. Not that they’re quiet. The bubble-like covered spaces thrum with a strong pulse of their own–especially on weekends. They bring together under one roof people who appreciate food and the social interactions that come with shopping at these sorts of markets. 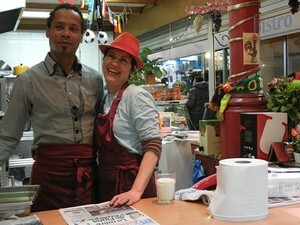 The day I was at this particular covered market, I met Périco Légasse. He was sitting on a stool enjoying a café at Bistro Saint Quentin, a pleasant respite in the center of the market where many customers know each other. Monsieur Légasse is a popular food critic, journalist, author, and television personality. He is the food and wine editor of the weekly Marianne magazine. Monsieur Légasse is an ardent champion of French heritage, local foods and farms, and designations of origin (AOC). 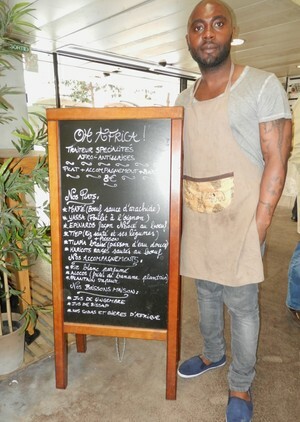 He told me that Saint-Quentin is one of his favorite Parisian markets because he appreciates the vendors’ attention to quality and their use of artisinal methods. All sorts of delectable options can be in found within the maze of aisles. 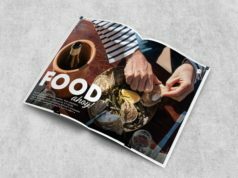 The poissonnerie “Les Viviers de Noirmoutier” gets fish directly from the coast. You can tell if fish are fresh by their eyes (look for sharp color, not cloudy), the colors on the body (look for vivid, not dull), and barely any fishy smell. Boucherie Jouve, near the rue Cabrol entrance, is a gem. It’s one of three butchers at this market. 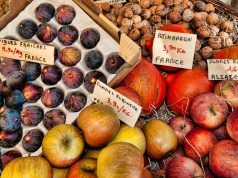 You don’t have to wander far to find superb cheeses, breads and pastries, fruits and vegetables (including one stand marked “AB” for agriculture biologique, meaning organic), and perky flowers. A charcuterie and traiteur offer several varieties of pâtes and rillettes. Eye-catching displays of rabbits and game draw customers at Rôtisserie Volaille. A bevy of ethnic stands–Portuguese, Brazilian, Italian, African, and Lebanese–offer take-out dishes. Beer drinkers are in for a treat since there’s a boutique that specializes in small-batch brews. There’s also a hardware store, key shop, and shoe repair. One of the most visible upgrades to this market since its renovation is public seating near the entrance. Children circled on scooters while watchful parents waited nearby. New overhead lights and heaters will make this market a comfortable destination year-round. Free Wifi was going to be added soon. 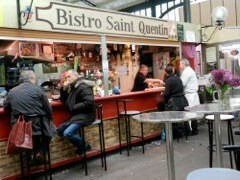 The Saint-Quentin covered market is located at 85 bis, boulevard Magenta (by rue de Chabrol) in the 10th arrondissement. It is open Tuesday to Saturday, roughly 8:30 am until 8 pm (although some shops close during lunch hours) and Sundays from 8:30 am until 1 pm. The nearest Métro stop is Gare de l’Est. Marjorie R. Williams is co-author, with Dixon Long, and photographer of Markets of Paris, 2nd ed. Her work has been featured in numerous travel and food magazines and blogs. She lived in Paris while researching and photographing the markets. Visit Marjorie’s website for more information. Great market to buy fresh oysters…. have the fish monger open them for you, he’ll place them on a ice filled Styrofoam tray (which you return), find a table, sit and slurp ’em down!